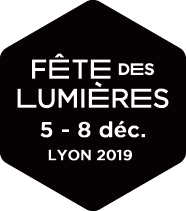 Fête des Lumières | Elephantastic ! An odd encounter right in the city center. An African elephant really is caught beneath the archways of the Passage Ménestrier, between the Rhône and Presqu’Ile. A spectacular, strikingly realistic image concocted by the two Lyon graphic designers. Floating weightlessly above the cloud of dust created by its footsteps, the pachyderm seems to emerge from a dream. No waking up!